Tonight marks the beginning of the 56th Annual Grandfather Mountain Highland Games. The opening ceremony is dramatic and symbolic and beautiful, and I can hardly wait! It is called the "Raising of the Clans," and long ago it was an appeal to support a cause or ideal -- usually to unite the clans for battle. Modern times have altered its purpose, but the raising of the clans is an important part of many Highland games. At Grandfather Mountain, the ceremony begins after dark. A representative from each of the clans/families in attendance bears a torch, and these representatives assemble on the field in such a way as to form a St. Andrew's Cross -- a living cross of light. In turn, each clan is called, and its representative comes forward to say a few words; most often the clan motto is recited and perhaps a few other things are said, but always, always, they express their pride in being involved in this magnificent gathering. Off to one side, high atop an observation tower, a lone piper stands. As the torches burn brightly against the night sky, he plays, and the effect is so stirring as to bring tears to many eyes. We're going back out on the road in a little less than a week. Dulcimer? Check. CD inventory? Check. Iron Frying Pan? Oh, you better believe -- Check! The dulcimer and the CDs are tools of my trade, but that old black skillet is an important part of our life. The pan once belonged to my grandmother; Meemaw, we called her. It's at least 50 years old and probably a decade or two (or more) older than that. It's been lovingly, properly, cared for over the years ... if you know how to care for cast iron cookware, then you know what "proper care" entails: we never use soap to clean it. If you don't understand how to care for these utensils (or if you happen to work for the health department) you probably think this sounds pretty gross. But this treatment helps to season the pan and contributes to its non-stick properties. Every year, before we go on the road, I take time to re-"season" the pan by giving it a good scrubbing, coating it with a thin sheen of peanut oil and then placing it in a 200° oven for a couple of hours; this accounts for the shine you see in the picture. I can't even imagine trying to figure the number of meals I've consumed that have been prepared with that pan. Nowadays I stir-fry a lot of vegetables, occasionally fix bacon or sausage, and it's my go-to for certain Cuban dishes. I make a mean corned beef hash with it, and there's a funny story associated with the hash: When my brother and I were little, we used to spend many weeks during the summer with our grandparents in Brooksville, Florida. 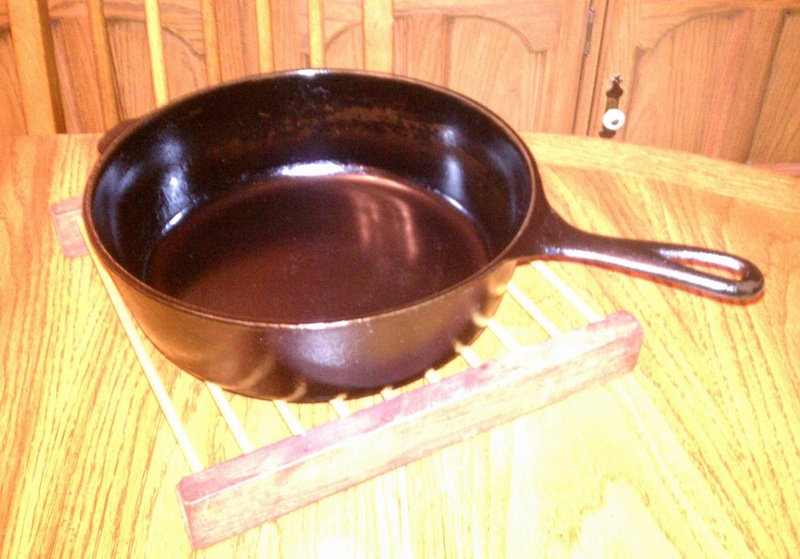 Mind you, we called our Brooksville grandmother "Mimi," and though she was not the owner of this particular pan, she did have a pan something like it; I imagine that many, if not most, Southern women of that generation used cast iron cookware. Among our favorites of Mimi's dishes was corned beef hash, and when we went back home, we would plead with our mother to make hash. But hers was never quite as good. I hope I didn't hurt her feelings by telling her that it wasn't "quite right," and I never could exactly tell her what was different, but it ... just wasn't the same. As an adult, I tried to make hash myself, but it just wasn't right ... until this pan came into my possession. The very first time I made hash with this pan, I discovered that Mimi's secret ingredient must've been the cast iron pan she used. Scientifically, it can probably be explained by the evenness with which the pan conducts heat. I tend to think it must be magic. The one dish that I've never learned to make, in spite of possessing the magic pan, is Meemaw's fried chicken. I know she used this very pan to make her chicken: a perfectly seasoned, golden brown, crispy yet tender, moist but never greasy masterpiece. I should've asked her to teach me, but somehow never got around to it. Scientifically, there's probably a step -- or perhaps two -- that I never observed and therefore have missed in my own attempts. I tend to think, though, there was a secret ingredient: Love. We have to be pretty spare in our choices of what to take on the road with us. Everything has a purpose, and if an item can serve multiple purposes, all the better. Like I said before, the dulcimer and the CDs are tools of my trade. But the old black skillet serves its purpose as a cooking utensil, as a treasured "antique," as an heirloom connecting me to my wonderful Meemaw. All of the memories and all of the love have seasoned that pan, and consequently memories and love season every meal that is prepared using it.